﻿ How to make Popup visible only for first-time users? The issue, which migrates from question to question from our users and clients: How can we switch the Popup only for our first-time guests on the site? We definitely think about you and because of this reason – we create a small tutorial with options, that can require your needs. Before starting it we want to remind you that Popup plugin can easily boost the number of your subscribers, guests and constant users of your site. With the help of it, you can gather their emails, make for them some advertisement popups, sales and quick deals. The most important and useful marketing tool, which was created on the base of WordPress ever. Supsystic team created it maximum easy and user-friendly for newbies, but enough functional for clients, who are real professionals in WordPress using. For first-time users – This option has even the same name of your purpose. 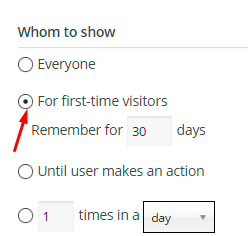 It allows you to set a period of time, on which your site and our plugin will remember user visit for entered number of days and show PopUp to same user again – after this period. To remember only for one browser session – use 0 here, to remember forever – try to set big number – 99999 for example. Like a result your user will see popup only at first time, and as many times as you do not want he will not see it. Seems like Popup by Supsystic has a pretty understandable and simple interface, doesn’t it? One of the best plugins for WordPress has even other option for it. After you decide how your Popup will look like and where/when it will be shown do not forget to save the result and insert its shortcode on the page. Pay attention that this is not all functionality of ur plugin. You can enable/disable it for some device, countries or even languages of your future users, stop showing it for some social engines and social medias, or show it for a little amount of IPs. As you can see it’s has a wide range of options and can be easily customized for your properties. Popup by Supsystic includes tons of cool options available to you! Check more variants for your own site WordPress Popup examples.